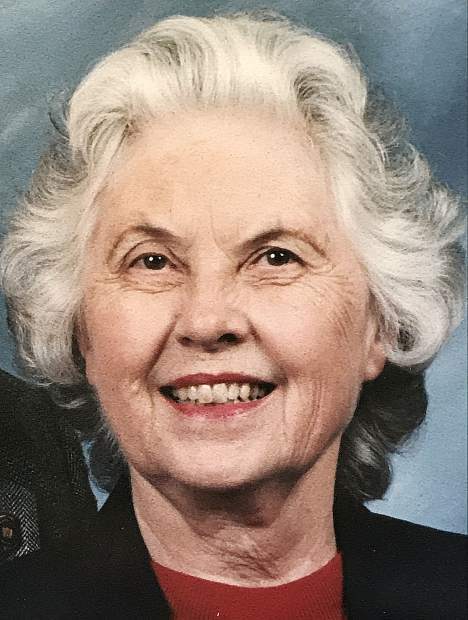 Margie Barnett passed away on March 8, 2018 at Golden Empire Nursing and Rehab Center in Grass Valley. She was 90. There will be a memorial service held at 2:30 p.m. on Thursday April 12, 2018 at the Penn Valley Seventh-Day Adventist Church. Margie was the first of three children born to Russell and Adah Miller of Howell, Michigan. She graduated from Houghton College, NY in 1949 where she met her husband of 69 years, Beverly J. Barnett. After graduation she earned a Masters Degree in Education at the University of Michigan. Margie then started a long career of teaching while accompanying her husband during his military career as an Air Force Chaplain. For about 45 years she taught at schools on and off USAF bases from Japan to Newfoundland. She taught every grade from kindergarten through college at one time or another. Her final teaching job was at Alicia Intermediate School near Marysville, CA. While Bev was assigned at Beale AFB in 1971 they bought a lot at Lake Wildwood and built a retirement home on it in the early 80’s. After retirement Margie and Bev continued to enjoy traveling and were very active in the Penn Valley Community Church. For the last five years, Margie’s life was taken up with the failing health of Beverly. Tirelessly she arranged and provided for all the care of his medical and physical disabilities. Bev passed away seven months before Margie. Now they are together again with the Saints in Heaven. Margie is survived by her son Mark (Karen) of Eagle River, AK; daughter Deanne (Stephen) Mahoney of Burke, VA; six grandsons and three great-grandchildren. In lieu of flowers, please make a donation to SIM-USA, PO Box 7900, Charlotte, NC 28241 to support the missionary ministry of Dan and Kim Scheel.